Don Lomax's critically acclaimed Vietnam Journal is back with all new tales of Scott 'Journal' Neithammer as he reports on the heartache and headache, and on the young soldiers on both sides of the Vietnam War. This volume takes 'Journal' from late 1969, the Monsoon season, to May of 1970, and the beginning of the Cambodian incursion. As the war officially spreads into that neighboring country and tests the South Vietnamese Military on their capabilities of sustaining the war against the North Vietnamese Communists on their own. 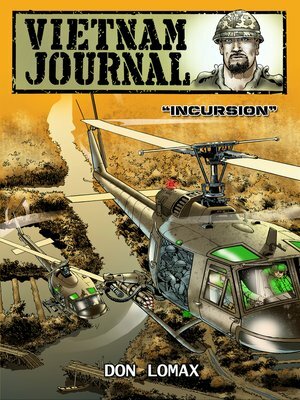 Along the way 'Journal' finds himself caught in the crosshairs of a juvenile sniper, and a private war for his own sanity as he is forced to fight a plague of rats at a forward firebase. And from a bitter sweet tryst in a back street bar in Saigon, to rolling into Cambodia with an untrustworthy cameraman new to his craft...the action never stops and questions about Neithammer's career choice continually lay just below the surface. Collects comic issues #1-5. Praise for Vietnam Journal: "Lomax bases his fictional work on his real experiences in Vietnam in 1966, with powerful results. It is Lomax's concern for average soldiers that, in the end, makes his work significant." - Publishers Weekly.